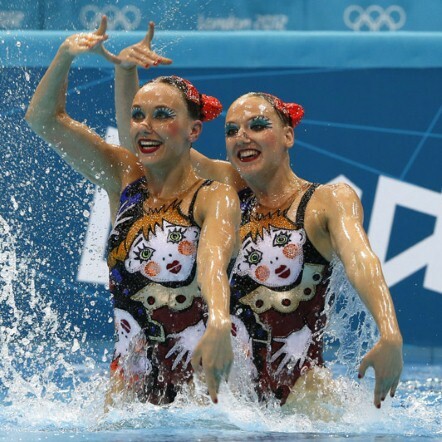 Campy Costumes, Shellacked Hair, Over-the-Top Makeup...it's not RuPaul's Drag Race, it's Olympics Synchronized Swimming! The London 2012 Olympics are coming to an end (insert sad face) and while there are a lot of things I will miss--fashion and non-fashion-wise: those low-slung men's swim trunks (OMG Michael Phelps, Ryan Lochte and Tom Daley! ), the ball-tossing Rhythmic Gymnastics and the bravado of those men's track-and-field DIVOS (Yes, Usain Bolt, I am talking to you!). There's also things I won't miss, particularly those DRAB-as-DRAB-can-be gray Nike hooded parkas that the Gold-winning US Gymnastics Team wore on the Medal Podium. But back to the positive: somehow I missed discussing those AMAZING swimsuits/costumes from the Olympics Synchronized Swimming competitions. Russia's Ishchenko and Romashina--who clinched the Gold as expected in the Duets Competition--did a fabulous routine wearing Michael Jackson-bedazzled silver and black leotards. These were simply INCREDIBLE! I want a Swimsuit company to put these out and sell them! 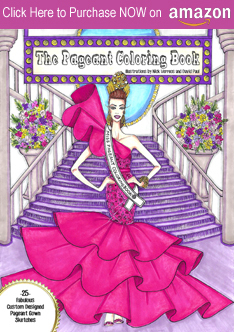 Imagine the next time at your Princess Cruises vacation and coming out to the pool and seeing a girl in one of these! I would run to her and give her a Fashion Medal! Argentina: The South American duet wore halter-necklined gold, white and black swimsuits that gave a trompe l'oeil effect of a vest on top of a leotard. And yes, the vest was bedazzled, of course. Austria: The Austrian Synchronized Swimming Pair wore dirdnl-inspired swimsuits (naturally, it's AUSTRIA for goodness sakes!) but there was a bit of España as well. The bold red and black colors plus the faux lacing on the sides all added for an imaginitive way to inject a little bit (or a LOT!) of national costume/folklore into their performance. France: The French duet team went with more of a swirly-patterned costume/swimsuit for this portion of the competition. I do like the colors--rose, bubblegum pink, lemon yellow and black--and the (somewhat) delicate beading at the edges of the swirl applique. They're not Michael Jackson Fab but a good "costume effort" for France. Greece: My Greek "sisters" were not letting the sad economic depression occurring back in their country impede their choice of costume and use of fun bold colors. I enjoy the whole "SHAZAMM!!" effect of the swimsuits and rather large crystals. Italy: Wow. Favoloso Italia!! These neon green and purple beaded swimsuits/costumes were BY FAR one of my favorites of the entire Olympics Synchronized Swimming Competition. They looked like Sea Creatures in a Gay Pride/Cirque du Soleil parade!! Kazakhstan: This pair gave you tuxedos for their swimsuits/costumes. I like how the creators/designers incorporated the eyeglasses and the chain attached to them as if they are coming out of the tuxedo vest. There are SO many ingenious details in these swimsuits--notice the "braces"/suspenders and "cropped" pinstripe bottoms. Excellently designed costumes. USA: The US finished 11th in the Final Duet Results but these costumes were one of the Top ones for me. They were subtle and rather "discreet" on the Synchronized Swimming Swimsuit Campy Meter. I really liked the bold Olympic Torch design and how it was "front-and-center" standing out against a white and light blue backdrop of the swimsuit. South Korea: These costumes were very colorful and almost had hints of Boho Hippie Chick Tye Dye in them. Were there better costumes worn by the other athletes? Yes. But this was a "good costume show" for them. 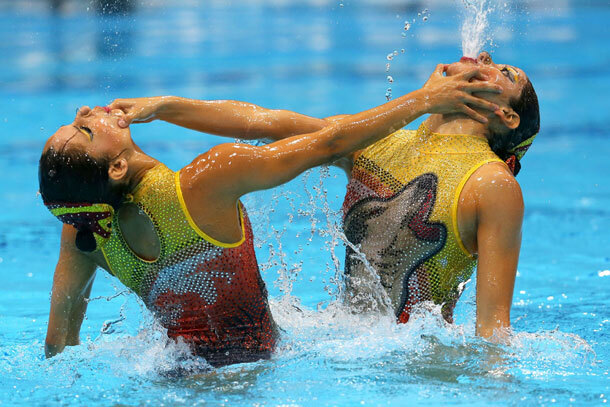 Spain: These Spanish ladies wore two of my favorite swimsuits/costumes of the entire Synchronized Swimming Duet Competition. 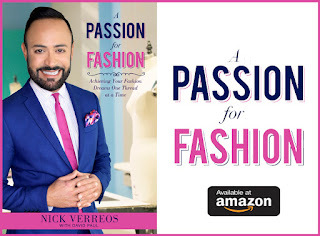 I could barely choose a BEST between the Flamenco polka-dotted suits and then, the red Sevillana one shoulder "Carmen" numbers directly above. They were both elegant, chic, striking and muy, pero muy fabuloso. Olé! Switzerland: When I took a look at these sequined swimsuits, all I kept thinking about was ABBA's "Money, Money, Money" song! In case you're wondering, yes kids, those ARE dollar bills imprinted on their costumes,in light green and neon yellow and done to look like the top of a side-exposing dress. I absolutely LOVE these! 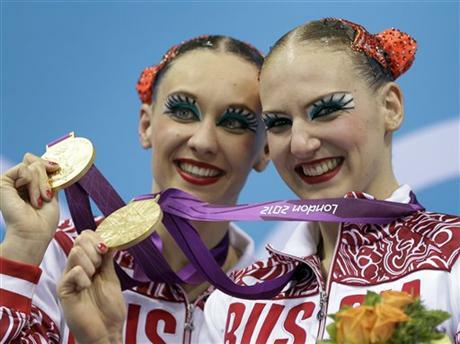 Russia: Finally, the Gold-medal winning duet from Russia and their cherry-cheeked clown costumes. They were Campy, Sequin-Fab and I do like that they embraced the theme right down to the painted-on oversized eyelashes and hair accessories. They looked EXACTLY like the pretty clown in their swimsuits/costumes. Congratulations Ladies and Thank you for Bedazzling my TV screen this past week! 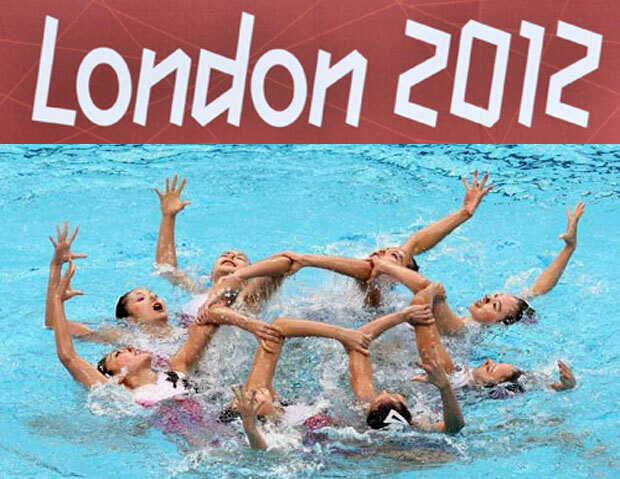 0 Response to "OLYMPIC STYLE.....Synchronized Swimming Costumes, London 2012 Summer Olympics"